Should writing fiction be all about fun? Should writing fiction be all about fun – or something else? 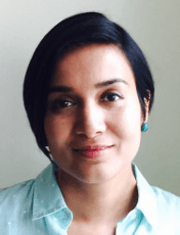 I’ve recently been interviewed by writer Damyanti Biswas, who was one of two writers commended by our judge, novelist and short story writer Annemarie Neary last October, 2015 in the inaugural Bath Flash Fiction Award. 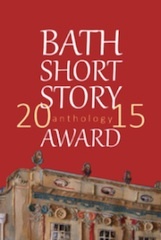 Damyanti’s commended piece, ‘Picasso Dreams’, which Bath Flash nominated for the Queens Ferry Press anthology, Best Small Fictions 2016, ended up being a semi-finalist out of thousands of worldwide submissions. Everyone at Bath Flash thinks that’s a wonderful achievement. In the interview, now posted on Damyanti’s blog – daily (w)rite, I said writing should be fun, and she’s suggested other writers comment on that. Should writing fiction be all about fun? Or should it be something else? My take on the subject follows below. You can add your comments on her blog. For me, having fun while writing doesn’t mean staying light-weight, or avoiding emotions. I love the absorption that writing brings. When I’m at the computer or scribbling in a notebook, writing an emotional scene can stir up a whole range of feelings in me. It’s not boring. When I let go I’m often amazed at what ends up on the page. Time flies, drafts of longer stories or flash fictions get written – usually ones I haven’t thought about in advance. This process of allowing ideas, plots, and characters to form as I write is an endless source of pleasure to me, even if the subject matter is challenging. A ‘source of pleasure’ is one of the definitions of ‘fun’. Editing is also satisfying, particularly if I move out of a blinkered fog and notice bad habits, or improve the work by cutting away flab. Writing is like eating good chocolate – you savour the pieces, then stop before you get sick of it. Running competitions, although hard work, is very much fun – particularly notifying winners. Who wouldn’t like informing writers that their stories have won big cash prizes and will appear in print? Reading the huge variety of stories entered to the competitions is fascinating. And of course, reading is part of writing. I also like supporting writers and other contests via social media, particularly twitter. The amount and variety of interesting and challenging writing on the internet is astounding. It’s fun ferreting it out and promoting the successes of other writers. At Writing Events Bath where I lead creative writing sessions with my friend Alex Wilson, we suggest writers imagine sending their inner critics on holiday. 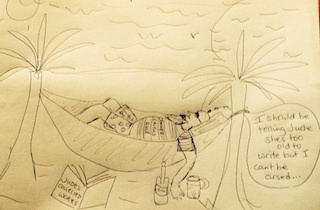 Drawing a cartoon of a grumpy character lounging on a sun bed, takes the sting out of that inner carping voice. Writers love creating first drafts in a relaxed atmosphere. So what if writing ceases to have any element of fun, satisfaction or absorption? It’s like any other relationship. You probably work on it for a while, then decide to let go. Or you stay with it, knowing that something will change. Nothing stays the same. Previous Previous post: Writer’s Block – Does it exist?